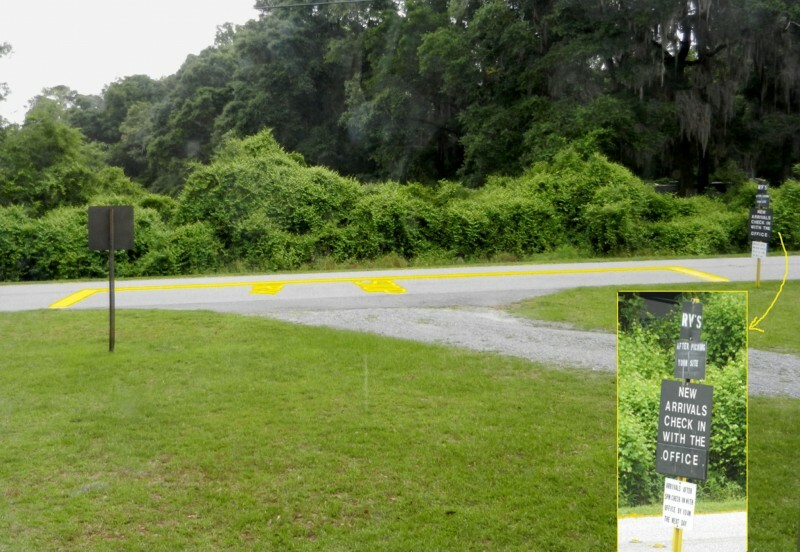 This park is perfect for an overnight stop when traveling I-75. They do take reservations. However, pay no attention to the Site # that is supposedly reserved for you. We arrived after office hours & were headed for the site that we had been given when we made the reservation. Luckily, one of the maintenance people stopped us. He thought we were headed to the office. We told him the site that we had reserved. He then told us that spot was taken & explained that it really is first come to the sites. Luckily, there were several pull thru sites open. This park is a great setting for water recreation. It is not near the base, but is set for getting away with easy access. There is a Cracker Barrel nearby. We ate dinner at a local place called Farm House. We would recommend it. It's on the other side of the interstate but easy to get to. We will definitely stay here again as it does break up our trip going to Florida. We'll make sure to get to the park earlier so we know that pull-thrus will be available. This campground is a gem! Very quiet and rustic. Lots of Spanish Moss hanging from trees and beautiful 3 mile nature trail. There are a pair of nesting eagles on site and several large owls. The Lake is wonderful (hard to catch fish though) but great to sit on the docks and just have a cup of coffee. This is a nature lover's paradise! The community center is newly remodeled and beautiful. The manager is very pleasant and works hard to make guests feel welcome. Of course you always get a few who do nothing but complain around the campfire but really couldn't see what their problems were. Staff tried to be helpful and the place was very clean and well maintained. Manager obviously has the base engaged (new construction going on down in the main park while I was there). Will definitely be back next time through. Rumors about time limits are true and false. 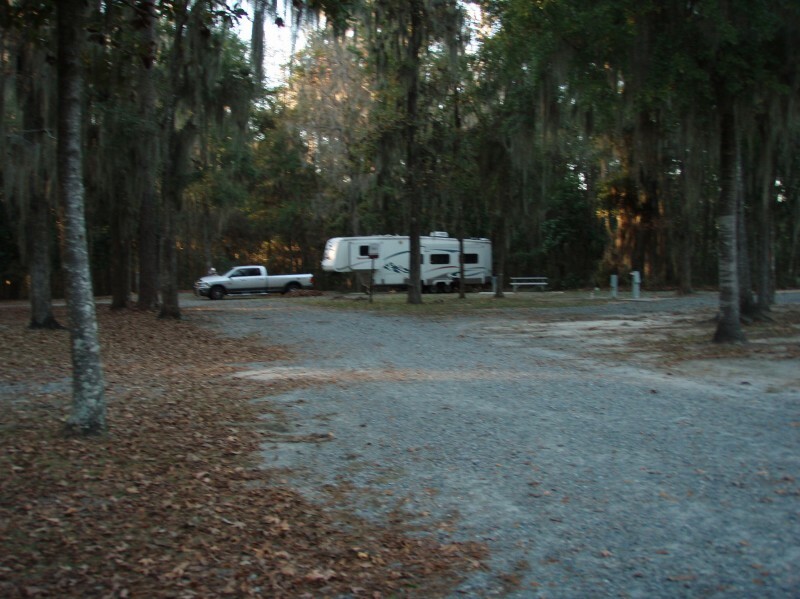 As long as campground is not at 100% capacity, manager works around your needs. 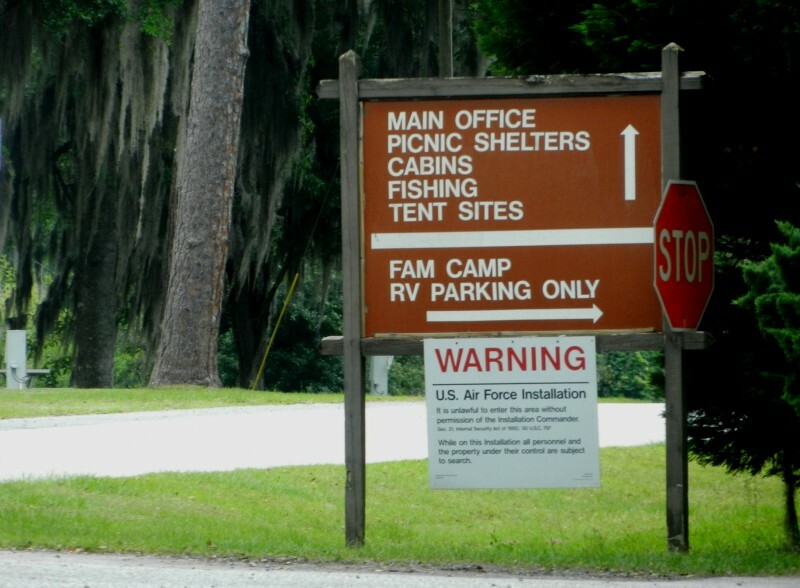 As with most military campgrounds, if they fill up and have a waiting list, then he told me he will have to enforce the 60 day limit, but everyone I talked to said that hasn't been a problem in the last 2 seasons. Great place to stop over for a few days, few weeks, or few months. Better than being in the snow and ice! This is our time at this CG and again were very pleased with our stay. Stayed in main camping area this time, gravel, dry and level site. Water, sewer, power 30/50 amp, CATV and WIFI available with good signal at our site, the closer you get to community center the better the signal. Bathrooms are clean and well maintained, shower was good and hot in the new bath. The Community Room is open 8:30 to 5 and does not appear to be used much. There are a few docks on the lake and a nice concrete boat ramp. 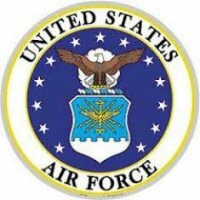 Valdosta is about 15 minutes away and the Florida state line is about 10, Moody AFB is another 10 to 15 minutes past Valdosta off I-75. Wal Mart is about 15 miles. There is a 3 mile trail around the lake which is a nice walk but this time of year the trail is covered with leaves and the covered roots can trip or twist ankles, I recommend using hiking shoes for ankle support and take your time. Loved our visit and will visit again. R.L. 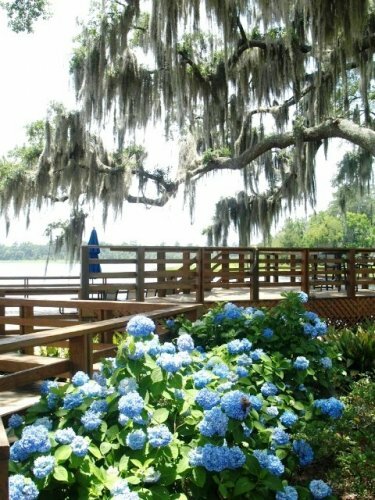 left this review using the Directory software: - This campground has been totally updated and is a place to stay and unwind. As stated before there is a children's pool but they have now added a mushroom-looking water system that showers down into the pool. There are lounge chairs around the pool for watching young ones. A wonderful playground. It is just about empty and I don't understand it. There are two trailers, 1 tent and 2 motorhomes. It seems like a heavenly place for families to come. We were here over Memorial Day and it was still nearly empty. Just a couple miles off I-75 and so easy for North or South travel. They have put a lot of money in this place and people are not using it as I would think. It is a shame. Be sure to visit on your way up I-75 or South I-75. This is our 2nd time here and we've seen such a difference. We will be back. This was our second stay at Grassy Pond in the last two months. It is a real gem! Easy to get to, great location, lots of shade trees, and large spaces. We will definitely come back here again! This is our first time visiting this campgroud but it will not be our last. The campground is clean and well maintained by the staff.I understand this campground use to be full of homesteaders but they are gone and there is now a 60 day stay limit. 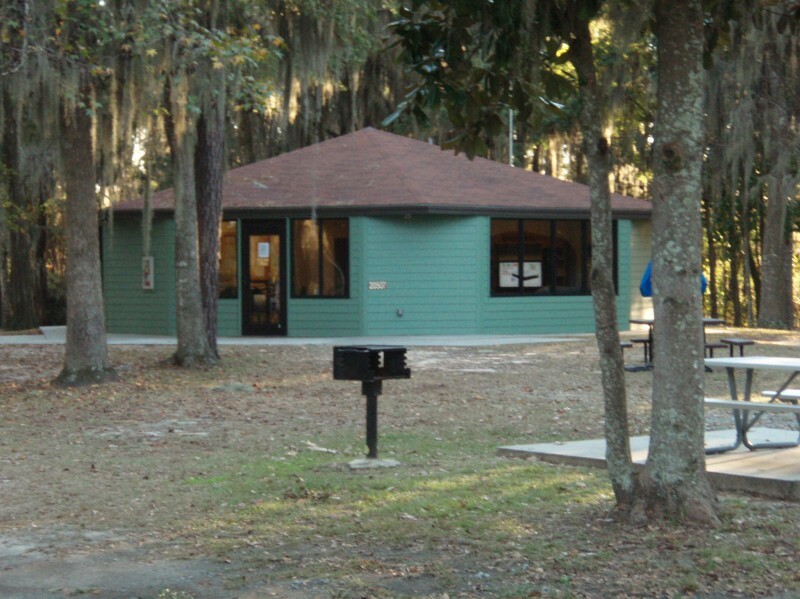 The campground is currently undergoing several renovations that should be done in 60 - 90 days. There are plenty of good eating places in the area. PX, commissary, wal-mart, etc are all within about 30 minutes of the campground. If you are looking for a nice quiet leisure place to visit I would deffinetly recommend this campground. Very nice site. It was too cold for us to wander, but there's a nature hike and the hills look like good bike riding :) No open campfires, but the sites are nice and clean, and have a bbq. My only complaint, and it's tiny, is that there were not enough hooks in the shower area to hang your clothes. Otherwise, the facilities were great. Looking forward to coming back in the spring! Easy to find the campground off I-75. There were no signs to the office where we were supposed to check in but we figured it out. We unhooked our towed car and found after we did that there is a turn around in the parking lot near the office. Not very convenient but no big deal. 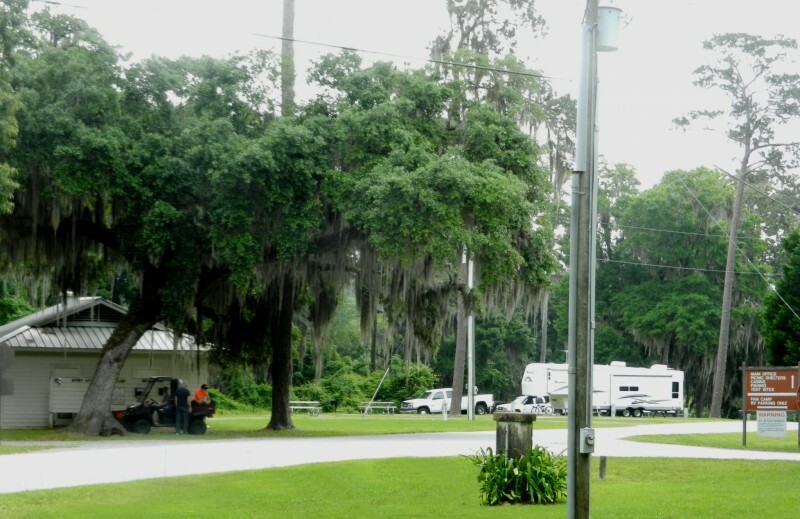 The campground was very well maintained with grass mowed and camp sites in good order. We wanted to use our in-motion satellite for TV and moved to an open site which they accommodated for us. We enjoyed a hike around the lake on the Nature Trail near the campground. The laundry was small but has two washers and four dryers at $1 and $1.25 a load. We camped in a 40' MH and will be back. Stayed here 2 weeks. I'm not a number rater, either I like a campground or I don't. Well, I like this famcamp! Very quite and peaceful. Had full hookups (water, sewer, elec, cable,). Wifi located near office. Had a lot of snowbirds here, but they keep some sites for short term stays. Host always had something going on to keep you entertained. Shopping & dining out close by. The base is actually about 20 miles away. Will certainly come here again. My wife, my grandchildren and I spent Thanksgiving weekend at Grassy Pond Campground. We only live 60 miles from Grassy Pond in North Florida. I am so glad they now take reservations as that has been a drawback that has prevented us from staying here in the past. Upon arrival the Campground Host directed us to our site and assisted me in backing into the site. Grassy Pond Recreation Area is very clean and the staff members were very friendly. It is a very short drive to Wild Adventures Theme and Animal Park. Our grandchildren had an outstanding time. We look forward to many more visits in the future.